Whether your a Democrat or a Republican this hat will stylishly convey what is everyday becoming a more and more common sentiment. 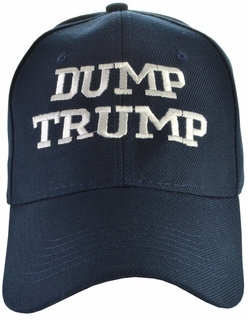 No frills needed, this is a simple blue quality hat embroidered in large white letters "DUMP TRUMP". Unwritten but implied is "before it's too late". The hat is one size fits all, made of 65% wool/ 35% Acrylic and has an adjustable velcro strap.